Things have been going from bad to worse for President Trump’s former national security adviser Michael Flynn, but one allegation made against the general turns out not to be true, according to two eye-witnesses. Last week, Flynn declined to comply with a subpoena from the Senate Intelligence Committee as it investigates possible Russian interference in the 2016 U.S. election, invoking his Fifth Amendment constitutional protection against self-incrimination. Flynn, an early supporter of Trump, served as national security adviser from Jan. 20 until he was forced to resign on Feb. 13 after he had misinformed Vice President Mike Pence about a phone call he had with the Russian ambassador in December of 2016. On March 8, acting Attorney General Sally Yates testified before a Senate Judiciary subcommittee that she had warned the White House that Flynn had not been truthful, based on an FBI investigation. Flynn, a lifelong Democrat, who was also fired from the post of director of the Defense Intelligence Agency by President Obama in 2014, apparently misled Pentagon investigators about his foreign connections when he sought to renew his security clearance in early 2016, according to a document obtained by congressional Democrats and released in part. He has also been criticized for having received $45,000 from the Russian state-backed television company Russia Today for a speech at a public event in 2015 in Moscow and not disclosing the sum. However, there is one thing that Michael Flynn did not do, he did not speak to Russian President Vladimir Putin at the 2015 event, although most commentary written about him make it look as though that was the case. “[Flynn] received about $45,000 (£36,000) for attending RT’s gala dinner in Moscow, where he sat next to Putin,” states an article by The Guardian. 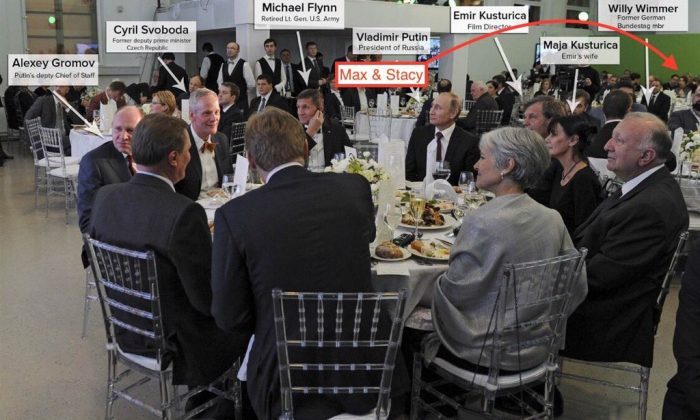 Indeed, in this photo, Flynn sat right next to Putin, but only for a couple of minutes and not for the dinner section of the event, as Putin did not even attend the dinner, according to eye witnesses. Stacy Herbert and Max Keiser, who host the Keiser Report on RT and attended the event, said Putin only said “hi” to Flynn, and the two did not have a meaningful conversation. “Putin was not at the dinner, and you can see even in that photo he has no plates in front of him, everyone else does, there is no food in front of him. There was a dinner, then there was an event, where the head of RT, Margarita Simonyan … gave a presentation and they showed a little film,” Stacy Herbert told The Epoch Times. “Putin only arrived about a minute before that, sat down, nodded to [Flynn], nodded to Jill Stein … and then just said ‘hi’ and then watched this event. And then he went up on stage, and actually imitated Max, and then he left right after, went off-stage and left,” she said. Herbert thought it was very strange that this particular event and the photo were so widely publicized since Flynn and Putin did not talk, although Flynn did have conversations with Putin aides during the dinner. “It’s strange to have observed a situation that then starts becoming bigger and bigger. When it first was announced, I thought ‘oh this is going to blow over’ because I saw what happened,” said Herbert.